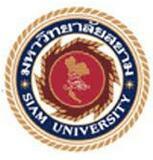 Siam University is a university located on Petkasem Road in Phasicharoen district of Bangkok. Siam University was founded by the late Narong Mongkhonvanit as a three-year private engineering school in 1965. In 1973, Siam University, then known as Siam Technical College, was formally established as a higher education institution with authorization to grant degrees. Later in 1986, Siam Technical College became Siam Technical University, a full-fledged private, non-profit university. Three years later, the name was changed again to Siam University to reflect the diversity in the fields of study offered. In 1995, the international college was established. Currently, over 400 international students from more than 15 countries are enrolled in the international college of Siam University.